Made from non-wood sources when feasible. 100% PCW recycled fiber is the best choice, but at least 30% PCW recycled minimum. Certified Ancient Forest Friendly (See Canopy’s Ancient Forest Friendly database). Manufactured using renewable energy, or be offset by legitimate renewable energy credit programs (such as Green-E). Sourced and manufactured as close to the printing facility as possible. A local printer within 100 miles of you (or better still, within 100 miles of where the final printed piece will be distributed). Certified by a legitimate third-party environmental group. While it doesn’t provide a guarantee, legitimate certification can ensure your printer takes these issues seriously. A formal energy reduction policy. A formal waste reduction/recycling policy. A formal benefits program and regular safety training for their employees. A printer should respect their staff as much as they respect the environment. If they are willing to discuss the above policies with you. Environmentally-aware printers should be open to educating you about their processes, as well as willing to learn themselves. Use our Project Calculator to minimize paper waste during the printing process. Consider using digital or waterless printing to reduce overall VOC emissions. Proof on screen as much as possible to reduce paper waste. Use makereadies, overruns, reclaimed materials, or other scrap paper as the base stock. While ink chemistry changes (sometimes dramatically) depending on press type, substrate, ink brand, and individual printer practices, this list can help you choose the best options for your next project. Less is more. The more ink on the page, the more difficult recycling can be. 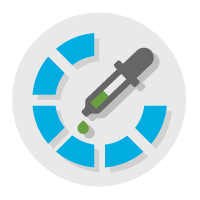 More ink means more waste for the printer to dispose of and more energy needed (both during printing and during recycling). More ink coverage also means more solvents needed on press. Plant-based ink instead of petroleum (linseed, cottonseed, tung, flaxseed, soybean, or other agriculturally-derived oils) in offset printing. Emit VOC levels of 5% or less. Heavy metal is for music. Omit inks with heavy metal additives (found in most fluorescent and metallic inks). Be sourced from local vendors. Require only nontoxic solvents and additives for offset presses. Be part of an ink recycling or recovery program on press (ask your printer how they handle their press waste).